Top up and go - anywhere, anytime. Minimum charge: £1 per rental. The best option for a life on the go! Watch: How does BTN BikeShare work? Choose your plan and sign up for a BTN BikeShare membership through the website or mobile app. Enter your mobile number or account number and 4-digit PIN into the keypad on the back of the bike to unlock it. Place the U-lock in the holster before you get going. To make a quick stop, press the “HOLD” button and lock the bike to a rack. To end your ride, lock the bike to any BTN BikeShare Hub. If the hub is full,. you may lock the bike to nearby public bike parking. If you lock the bike too far away from a hub you may be charged a fee. Whether you are an experienced rider or new to urban cycling, here are some simple tips to help you feel more confident on the road. 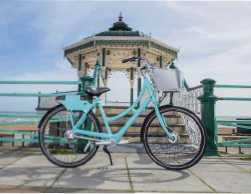 BTN BikeShare is the best way to see Brighton & Hove. To help you find your way around, a new online cycle map has been created by the city council to help cyclists in Brighton & Hove choose routes which suit how they like to ride. It shows features like cycle lanes and cycle contraflows as well as handy spots like cycle shops and parking. The map can be found here. If you’re visiting, showing guests around, or just want to be a tourist in your own city, check out these local experiences and rider rewards, just for you. Life Water® is the British natural spring water brand, with a conscience. Every Life Water drink purchased, funds clean water projects across the globe. 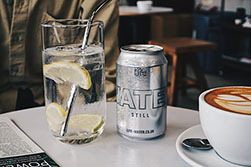 To find out more about Life’s #ZeroPlasticSolution and their work to alleviate the World Water Crisis, go to life-water.co.uk and follow @lifewateruk. First, you need to register for BTN BikeShare. You’ll be assigned an account number and you’ll get to choose a 4-digit member PIN. Find a bike on the System Map or mobile app, go to the keypad on the back of a bike. Type in your mobile number (or account number if you have been assigned a 6-digit number), and your PIN. The bike will then release the U-bar lock for removal. You can also reserve a bike ahead of time from the website or mobile app, so the bike will be waiting for you – you’ll just need to type in your PIN when you arrive. Yes absolutely. Find the bike you want using the app, then click on “reserve this bike”. This will then be reserved just for you for 30 minutes. Please note that this time is included in your rental time as the bike is not available for anyone else during this period. Yes please ! Remember to always put the U-lock in its holster on the left side of the bike as soon as you unlock it. Otherwise you will not able to lock the bike at your destination. You can keep a bike out on rent for as long as you like, as long as it is returned before midnight on the day of rental. However all the time you have the bike on rent is considered rental time so you will be accruing charges (up a maximum of £12 a day). Of course ! Each bike has a “hold” feature which you will see on the screen. Pressing this will allow you to lock the bike (make sure it is to something secure) and keep it for your use only for 60 minutes. Please note that this time is included in your rental time as the bike is not available for anyone else during this period. To lock a bike to a BTN BIkeShare station or public bike rack, insert the U-lock into the two designated slots on the right side of the back wheel, pushing the lock in from right to left. Wait until you feel the click and see the ““thank you”” screen on the LCD display.You can end a ride by returning your bike to any station with an open rack – you don’t have to bring it back to where you picked it up, making BTN BIkeShare ideal for one-way trips. Find available docks on the System Map or mobile app. If the station closest to your destination is full, you can lock your bike at a public bike rack close to the station. Depending on how far this is from the nearest BTN BIkeShare dock, you may be charged a £2fee. If you lock your bike outside of the service area (marked on the System Map and mobile app), a £10 fee applies. If you do not lock the bike properly, the bike will let you know by beeping and the screen will flash. If this happens, don’t panic,. just push the U-Lock in a bit further, or pull it out slightly until it clicks. Who are Hourbike and Social Bicycles? Hourbike is the operator or BTNBikeshare. We are a very experienced bikeshare company, and run schemes across the country. You can find more details about us at www.hourbike.com Social Bicycles Inc is the US company that makes the bikes and rental system. Sobi were a pioneer of this type of “Smart” bike and have a network of schemes all of the US, and now in the EU. The Sobi app is used as it allows customers to also use bikes in other Social Bicycles’s schemes without re-registering. Look out for more SoBi schemes in the UK ! Infrastructure and start-up costs for the scheme were £1.45 million. An award of £1.16 million was granted by the Coast to Capital (C2C) Local Enterprise Partnership (LEP) with match funding of £290,000 from Brighton & Hove City Council. The project is to sustain itself financially once live. To lock the bike and finish your trip/rental, first position the bike at one of the hub docking points, with the dock to the right of the bike, so that rear wheel is over the hole at the base of the dock (this is to drain any water off the wheel). Then remove the U-Lock from the holster and insert into the two holes in right hand side of the bike lock, the rear one of which should be roughly lined up with the large hole in the dock. Push the U-lock into the bike and it should click in. If you don’t push it in properly the bike will start to beep, just adjust the U-lock by pushing in or pulling out a bit. When properly locked the screen on the back of the bike will display a thank you message and a summary of your trip. If for any reason the lock isn’t in properly, the bike will start to beep. Just adjust the U-lock by pushing in or pulling out a bit. If the hub is full,. you may lock the bike to nearby public bike parking. Do not lock the bike to any other structures (posts, lamp posts, fences etc) unless absolutely necessary as this may cause an obstruction or inconvenience for other pavement users. You may also be charged an out of hub fee for doing so. The system will automatically charge you a £2 out of hub fee if you lock the bike some distance from a hub. We want customers to use the official hubs at all times. If these are full, nearby public cycle parking may be used only as an overflow. We will know if you have locked the bike at public bike parking whilst a nearby hub is not full. All of your trips and their costs are shown both in the main website and app. When should I purchase an Easy Rider PAYG? If you want to just try the bikes, am unsure as to how much you will ride, or perhaps just here as a visitor for the day or longer, an Easy rider plan will suit you. The only commitment is £1 to get you started, then the rest is up to you ! The Easy rider plan does not expire, and you won’t be charged until you ride. You can of course cancel or upgrade to an Annual Membership whenever you want. Absolutely. Whenever you feel that your usage would be better met by an Annual membership, you can change your plan in the app or website once you have logged in. We actually allow you to take 2 bikes per Easy Rider membership. But please note that the second bike taken will be charged at the rate of £1 per trip plus the normal rate of 3p per minute from the moment of rental, and the costs added to your account. You are responsible for any use or misuse to all bikes rented under your account. Can I topup with credits? Of course, just login to the app or website and under Memberships you will find an “Add funds” option. If you purchase an annual membership, you card is charged straight away. If you go into negative balance your card will be charged automatically after a couple of days. When should I purchase an annual rider membership over an Easy Rider? If you think you will be making regular trips on the bikes, an Annual Rider plan may be much better, as you get 60 minutes of riding every day included in the plan cost, So it may be you never need to spend anything else. The Easy Rider costs at least £1 per trip, so if you make more than 6 trips a month, its cheaper to have an annual membership. How is my daily free 60 mins calculated? Your 60 minutes daily does not have to be in one ride. Each trip is timed from start to end of rent (including any reservations or hold time), and when you have used a total of 60 minutes in the current day, your account will start to be charged at the rate of 3p per minute.The 60 minute allowance is reset every midnight. We actually allow you to take 2 bikes per annual membership. But please note that the second bike taken will not have the benefit of 60 minutes included, its rental will be charged at the standard usage rate of 3p per minute from the moment of rental, and the costs added to your account. This works well for visitors or friends who you are happy to pay for occasional rides with, but for regular use another annual membership would be cheaper. You are responsible for any use or misuse to all bikes rented under your account. It is not the law in the UK to have to wear a helmet when riding a bicycle. We do ask you to consider wearing one however. Where can I cycle safely in Brighton & Hove? Please refer to the Brighton and Hove cycling map which is available online at www.brightonandhovecyclemap.co.uk for marked cycle routes and other useful cycling information. Hopefully we have all the information you need in this website. However of you need to get in touch with us use the contact details at the bottom of this page. Our contact centre number is 01273 978 096. We are at desks 9-5 every day of the week. The easiest way to report a problem with a bike is using the bike keypad. Before you end your rental, click Bike Fault and select the area of issue. The bike will be automatically taken off line until the engineers can check it. We will know the fault was raised by you so we can get back to you directly if needed. Why is the mobile app SoBi not BTNBikeShare? 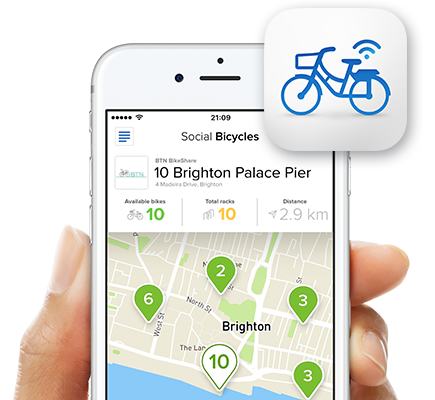 Sobi are a global bikeshare supplier, and through the one app you can potentially join multiple schemes - saves re-registering.. The app does go to sleep if not used, this may require logging out and back in to reconnect. Snap your ride with the hashtag #LifesARide to get featured below! If you have any questions about BTN BikeShare and how it works, you might want to check out our FAQ section first. BTN BikeShare in association with Life Natural Spring Water is a project funded through Brighton and Hove City Council and Coast to Capital, Operated by Hourbike Ltd.
BTN BikeShare is powered by Social Bicycles. Find bikes using our app!